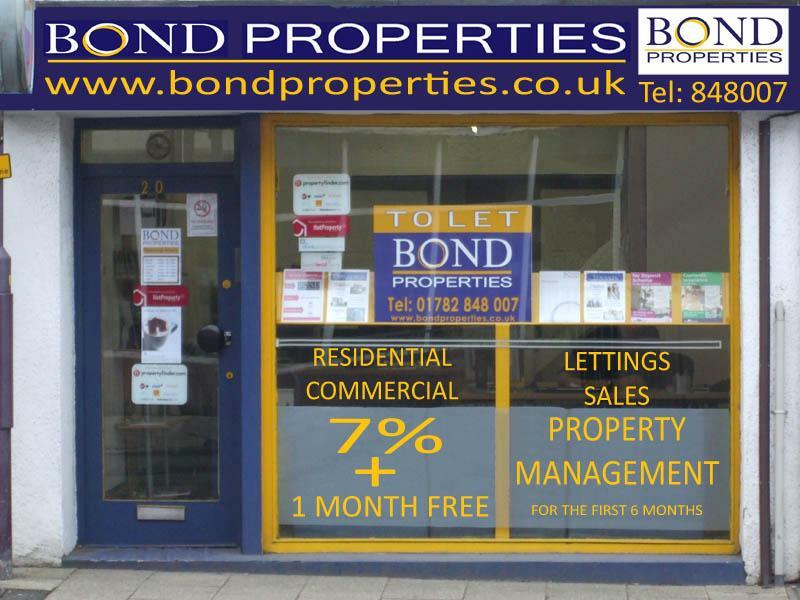 Bond Properties offer residential, commercial, lettings and sales across Stoke-on-Trent and Newcastle-under-Lyme. We pride ourselves in our honest and professional approach to property management. With our no let no fee policy and our special offer of 1 months FREE management and full management from 7% what do you have to lose. Rest assured that your property will be in safe hands and your investment will be looked. We will take the hassle out of property letting, allowing you to concentrate on buying more properties or simply living your life. Call us now to arrange a free market appraisal. Our staff are experienced agents with many years of letting experience. Bond Properties currently offer Full Maintenance, Let only and Collection services. We are currently gaining 2 or more new instructions every week and properties are taking an average of 2 to 3 weeks to let out. We have a good collection of maintenance engineers that we use on a regular basis who do not charge call-out fees and work at excellent rates. 7% Commission rising to 8% after 6 months.